Peach Blueberry Cobbler is one of my all-time favorite summer desserts! My Grandma would always make it with a tasty cake-like cobbler topping. 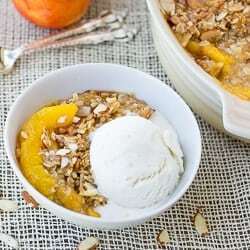 The peaches and blueberries are cooked into a delicious syrupy filling – then topped and baked. 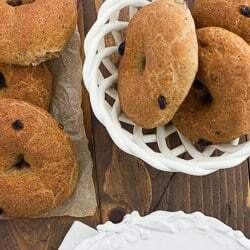 I’ve updated my Grandma’s tried and true recipe to be both gluten-free and refined-sugar-free. I think it tastes just as great as the original! Preheat the oven to 350. Place all the ingredients for the filling in a saucepan. Cook over medium-low heat for 5-7 minutes, until all the ingredients are incorporated and the fruit begins to soften. Remove from heat and pour into a 9×13 pan. Combine the dry ingredients for the topping in a large bowl. Mix together the butter and almond milk then pour into the dry ingredients. Stir thoroughly to combine. Spoon the topping evenly over to fruit layer. It is ok if there are a few gaps in the topping but try and make it as even as possible. Sprinkle with the sugar/spice mixture. Bake for 30 minutes, until the top is golden and the fruit is bubbling. Allow to sit for at least 30 minutes before serving. Enjoy! Thanks so much! This looks delicious. I made this last night, and it was DELICIOUS! Even my gluten-loving husband loved it! It was, by far, the best gluten free summer dessert we’ve tried! 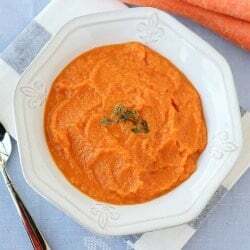 Thank you for a simple, delicious, wholesome recipe! I can’t wait to try more of your recipes soon! Absolutely Fantastic!! The whole family loved it. Can’t wait to try more of your Gluten free recipes. Thanks Erica! Glad you family liked it! 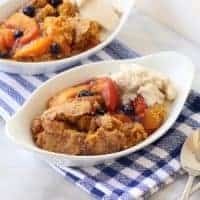 I have been searching high and low for a simple and great gluten free peach/blueberry cobbler recipe, and this by far looks like the best one. Planning on giving it a go this Saturday for my family who is coming in from out of town, I’m sure it’ll be a hit ;). Thanks for sharing! New to cooking gluten free. Is the all-purpose flour supposed to have anything like xantham gum, etc added to it? Yes! It should have added xanthan gum to use in this recipe.